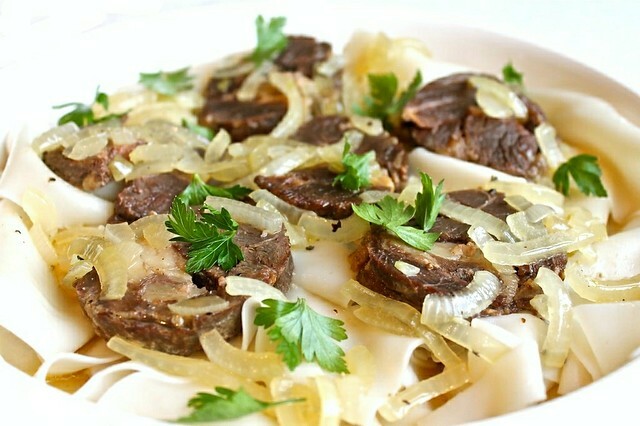 Beshbarmak is probably the most popular Kazakh main coarse, the first thing people come up with when asked about Kazakh dishes. It is a noodle dish with meat, and a very special one. The noodles resemble very thin and delicate lasagna sheets. 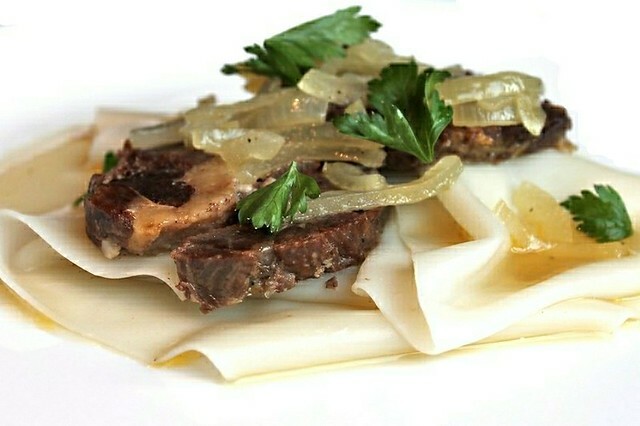 It is served with a selection of slowly cooked meats (first of all horse meat and lamb) and with the sauce made of delicious intense stock, onions and spices. The name of the dish translates as "five fingers" and has to do with the fact that traditionally it was eaten with hands in the old times. Nowadays in Almaty it is eaten with knife and fork. It is also shortly named just "besh" most of the time. Gulnazi's invitation itself was a luck to huge to believe it. While researching around beshbarmak and asking for the best restaurants to try it in town I heard all the time that beshbarmak is best cooked and eaten at home and isn't as good in restaurants. I already accepted the fact that I'd still have to start from the restaurants when Gulnazi invited me. Only after coming and meeting people in this city I realized how strong the hospitality traditions actually are there. I thought for quite some time on a present I could give back and came up with a jar of home made apricot jam. Fortunately, it got accepted with pleasure. Guljan (Gulnazi's mother) was making baursaks, when I came. Baursaks are Kazakh savory doughnuts, served alongside some meat dishes. She was placing flat rounds of pastry into hot oil and they were instantly puffing up and turning into golden spheres. I felt like just staying there in the kitchen next to this beautiful lady, watching her cooking and writing down recipes from her words. Needless to say the whole dinner was wonderful. And indeed I was given a chance to write down everything I hoped for. And even more. We started from those hot and delicious baursaks, some boiled kazy (traditional Kazakh horse sausage, described in detail in my recent story about Green bazaar in Almaty) with some home made adjika (traditional tomato and garlic sauce) and eggplant rolls. Then was the time for beshbarmak. Guljan cooked it with addition of potatoes, as this is the preferred way to eat it in her family. It was followed by a bowl of stock (which is also quite traditional in Kazakhstan and is deemed to be good for digestion). For dessert we had this wonderful home made cake and some fresh local peaches. These were clearly the best peaches I had in my life. As I brought some kazy with me back to Moscow I recently made my first beshbarmak at home following Guljan's guidance. It was quite some work, but I have to say I really enjoyed it. I'm sure it can't yet stand next to beshbarmak made by the Kazakh women, who learn to make it throughout their whole lives. However my family fortunately did like the result. Note: According to Guljan, the best combination is horse meat (in the form of fresh kazy) plus lamb and optional beef (brisket and other cuts which include both bones and fat are desirable as they yield the best stock). However as far as I got there are no strict rules here. In some families beshbarmak is even made with duck and other poultry. Note: Instead of making fresh noodles yourself you can use the special ready made dry noodles (zhaima) if it's available where you live. In Almaty it's available everywhere and Guljan does sometimes use it. In this case you will need around 400 g of zhaima. Note: Guljan's family prefers to add potatoes to beshbarmak. In some families, carrots are also added. However both vegetables are not necessary. Marinate the meat: The day before cooking (or at least 2-3 hours before cooking) cover all the meat (excluding kazy) with salt, pepper and minced garlic. Refrigerate in a plastic bag till you start cooking. Note: Guljan normally buys kazy way in advance and stores it in her freezer. She thinks that this way kazy gets better texture and flavor. The day before cooking she transfers it from the freezer to the fridge to let it unfreeze gradually. Cook the kazy sausage (if using): Place the whole sausage into a large saucepan. Stab it in several places with a wooden stick (otherwise it might burst up while cooking). Cover with cold water (you do not need to add any salt as kazy is quite salty already). Bring to a boil. Skim off scum. Simmer under lid for 2.5 - 3 hours, adding more water as you go if necessary. Take off the heat and let the sausage cool down in the stock for 1-2 hours. Take the sausage out of the stock and slice 5-6 mm thick (discard the coating). Note: Cooling the sausage down in the stock is not completely necessary, but it makes the further slicing much easier. By the time you finish cooking the sausage you will get quite a lot of horse fat floating on the surface of your stock. It tastes extremely good (something similar to duck fat). You can collect some of this horse fat and use it in the sauce for beshbarmak. Cook the meat: Place all the meat into a large saucepan (separately from kazy sausage). Cover with cold water and bring to a boil. Drain and rinse the meat. Once again cover the meat with cold water and bring to a boil. Add the bay leaves (if using). Skim off scum. Simmer under lid for 2 - 2.5 hours, adding more water as you go if necessary. Take off the heat and let cool in the stock for 1-2 hours. Take out of the stock and slice 5-6 mm thick. Note: Changing the water is not compulsory, but it helps to get a clearer and better tasting stock. Make the noodles (if not using ready made noodles): Sift the flour into a bowl. Add the salt. Crack in the egg. Add the stock (should be room temperature) and work the dough with your hands till everything is evenly combined. The dough should come out quite soft. If you feel it is very hard, add 1-2 table spoons of stock. Wrap the dough in a plastic film and let it rest at room temperature for 20-30 minutes. Take one third of the dough at a time and roll it on a well floured surface 1 mm thick (add some flour on top as necessary to prevent the dough from sticking to the roller). Cut into rectangles around 5 by 8 cm. Let the noodles dry on a floured surface for 20-30 minutes before cooking. Make the sauce: Take 600 ml of the stock you got from cooking the meat and simmer it for 15 minutes without a lit to reduce it by half. Heat a little horse fat or oil in a medium pan. Sweat the onions till they are translucent. Season with salt and pepper. Pour over the reduced stock, take off the heat and let stand under lid for 30 minutes. Note: Guljan doesn't reduce the stock, but I thought this way the sauce will come out more flavorful, and it did. She also doesn't cook the onions before pouring the stock over (thus the sauce comes out sharper). Cook the vegetables (if using): Bring the rest of the stock you got from cooking the meat to a boil. Add the whole peeled potatoes and carrots. Cook for 20 minutes. Take the vegetables out of the stock and cut into 2 cm chunks. Cook the noodles: Bring the rest of the stock you got from cooking the meat (and vegetables, if you used them) to a boil. Add the noodles and cook till ready and tender. This takes around 6 minutes for the ready made dry noodles and might take a bit less for the freshly made noodles. Drain the noodles and start plating up. Note: Sometimes the noodles are cooked in clear water instead of the meat stock. Plate up: Heat a shallow dish around 24 - 28 cm in diameter. Brush it with some horse fat or vegetable oil. Arrange the noodles on the dish. Arrange the slices of kazy sausage (if using) and meat over the noodles. Cover with the sauce and sprinkle with fresh parsley and dill. Serve immediately. After the meal, serve the hot meat stock in individual bowls, sprinkled by extra dill and parsley. I saw this posted on an LJ community, and followed it to this blog. I would love to try the recipe someday but I doubt if I'd be able to recreate it as I don't think we can get kazy or horsemeat in the UK - I've tried horsemeat in France, so could probably adjust flavours for it, but the kazy would probably be difficult. However, I love reading about home cooking in different countries, and feel this is the perfect way to learn about the methods and flavours - my favourite cookery book (Moroccan) adopts exactly this sort of approach to food, so your recipe had me hooked from the start! I've also bookmarked your blog, because everything I've read I've really enjoyed - love the colour, the variety and the passion!Thank you for sharing such wonderful recipes and reviews! I completely share your thinking about learning to cook international food from home recipes. I also read many blogs written in other countries to learn to make new dishes (most often those I tried and loved when traveled somewhere). If no kazy is available, you could go for either duck or lamb. Both will taste great and have lot's of character. Good luck!